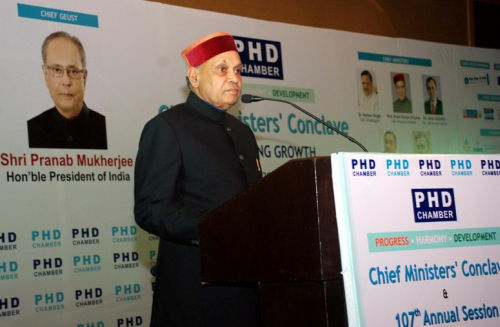 Chief Minister Prem Kumar Dhumal complimented the efforts of the Department of Personnel, Govt. of Himachal Pradesh and the National Informatics Centre(NIC) Himachal Pradesh in bringing Laurels to the State by achieving the “Award of Excellence” for the NIC developed Software Application “Manav Sampada – A Green Governance Tool for Human Resources” under the G2E Category of nominations during the recently held CSI Annual Conference at Kolkota on 2nd December, 2012. This award has been conferred to the Government of Himachal Pradesh by Padamshree Prof. P.V.S. Rao from the Tata Institute of Fundamental Research in the august presence of Sh. Surendra Kapoor, Convener CSI and Harish P. Iyer Fellow of the Institute of Chartered Accountants of India and other distinguished guests. The “Manav Sampada” software application was developed after the initiative of Chief Minister Prem Kumar Dhumal for bringing in efficiency in the administration. In the Committee of Secretaries continuous review was held under the chairpersonship of Chief Secretary for effective HR planning using the “Manav Sampada” application. Infact, the emphasis of the State Govt. for inclusion of PRIs under 73rd Constitutional Amendment, in micro level HR planning has also been made possible through “Manav Sampada”. Manav Sampada application has been developed as a complete HR solution for massive manpower of 2,34,705 employees of 146 Government Departments posted in 27,918 offices of Government of Himachal Pradesh. This application provides an interface for integration of the data with other e-Governance applications already running in the State, such as e-Salary, e-Gatg , e-Samadhan , e-Sameesha, e-Attendance, e-Sanchalan, e-PDS along with user authentication and master data of offices, vacancy position, employee strength, online transactions etc. In the last financial year itself, 35 Lacs transactions have been made through Manav Sampada in the form of Transfer, Postings, Promotion, Increment and Employee Service History etc. It is also used for analyzing the skill set of each employee by collecting the information like skills, compensation, personal details and demographic details. Manav Sampada has improved the Carbon Credit Rating of the State by saving paper, postage, fuel and employee costing to the tune of Rs 38.63 Crores per month. The green value of Manav Sampada is worth Rs. 5 Crore 50 Lacs per month. ‘Manav Sampada’ provides Dashboard based dynamic graphical interface to the decision support professionals for effective monitoring and planning of Human Resource. Online submission of ACR by individuals, ACR Movement to Reporting and Reviewing Officers, Locking of ACRs is a unique initiative taken by the Government of Himachal Pradesh for reducing the time gap in holding regular DPCs. It is the first integrated application of the Country for single signing-on for 17 e-Governance applications. It also provides GIS Integration for comparative reporting for area specific micro level manpower planning and SMS based dissemination of information to all stakeholders (Government Secretariat, Head of Departments, All Employees and Citizens).